In this post we’ll discuss which key financial figures you should be looking at and how to spot potential problem areas. There is nothing more ‘liquid’ than cash. Similar to your own personal cash flow, it’s always useful for companies to have access to immediate funds. Whilst other assets such as property are valuable, they may be of little use in a short-term cash flow emergency. It’s important to check how much cash a company has, but it can be more telling to look at the rate at which they’re ‘burning’ through it year on year. As a measure of the total amount a company owes to third parties, including bank overdrafts, this should always be monitored carefully. A trend showing increasing total liabilities each year without a corresponding increase in assets suggests that the company is becoming increasingly dependent on credit to operate its business, which it may or may not be able to pay back. Lenders and suppliers should proceed with caution. This is a ratio that measures the liquidity of a business, in other words how easily or quickly the company can meet its debts as they’re due. Calculated by dividing the amount of current assets by the amount of current liabilities, the higher the number the more reliable the business. This ratio is an indicator of whether a business can meet its short term commitments. Similar to current ratio, it’s calculated by dividing current assets by current liabilities, however, it excludes any stock from the amount of assets. It goes without saying that a rising bank overdraft is rarely a good sign, and it must not be forgotten that overdrafts are always repayable on demand. If a company has a growing bank overdraft but its current assets are not growing at a similar rate, the company could end up in trouble if the bank requests immediate repayment as it won’t have the sufficient liquid assets to turn into cash. The profit and loss account number is one that you would expect to see grow over a period of time, at least in a successful, healthy company. This number represents the ‘retained profits’ of the company. However, bear in mind that from time to time, companies may pay out large dividends to their shareholders that will reduce the profit and loss account balance, but isn’t normally a negative sign. The net worth of a company is its book value as measured by the Balance Sheet at a point in time, usually the last year end. In reality, the company may be worth more or less than this figure. This is because assets, in particular, are included at original cost as adjusted by depreciation. Some assets, particularly property, will go up in value and the balance sheet won’t reflect that. Nevertheless, this is still a key figure to use when assessing a company. Data is based on the latest filed accounts – which could be covering a period of over a year ago. The dates at the top of each column will show when each set of accounts were filed. Looking at trends is more important than just a figure. Each report shows the 3 most recent years’ accounts for you to compare side by side, but you can use the filter to look at previous years or, alternatively, you can download annual accounts for each year from the ‘Documents’ tab. Smaller companies don’t need to file full accounts at Companies House so information on revenues and expenses will be absent in some cases. In order to be classed as a ‘small’ company, they must meet two or more criteria set out by the Government. However, they do have to file a balance sheet which will provide plenty of clues as to how ‘healthy’ the company is. At first glance, the following company looks healthy – with a turnover of more than £260 million and almost doubling their post-tax profit since 2013, from £3.4 million to an impressive £6 million. Yet, their credit rating score is just 66, not an awful score but still lower than expected and slightly concerning. What are the possible reasons for this? When looking deeper into the report, you’ll find they have £50 million in liabilities, which includes £20 million in bank overdrafts. Further to this, the Credit Risk section of the report shows 14 mortgages with various different banks. So the message here is, be careful not to look at one number in isolation. Make as many enquiries as you can to build a reliable understanding of the company’s activity. Ready to assess a partner or supplier? Get a company credit report now. We hope you find this post helpful. 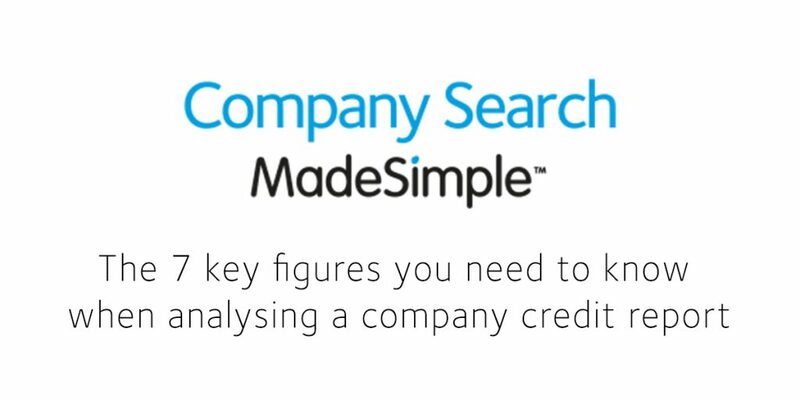 Visit Company Search MadeSimple now for more information on how we can help you gain insight into any business and director. is a Marketing Executive at MadeSimple. at When she’s not in the office, you can find her at home in pyjamas trying to catch up with everything on Netflix, often with a cat and chocolate by her side. Other loves include reading every magazine going and music concerts.